The John Pemberton who didn’t invent CocaCola! John Pemberton is a famous name. But this one is famous for reasons other than the dark beverage. In fact I don’t think I’ve ever seen him drink one. 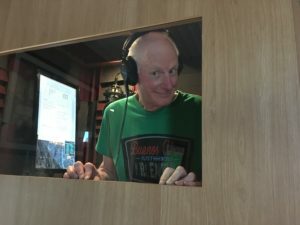 This Pembo is a radio veteran and musical guru. And he will tell you that gladly after he de-throned me as Rock Trivia King on a late night night TV show in the 80’s Nightshift hosted by our dearly departed mutual friend David Daisy Day. He spends his time these days as a musical sponge, soaking up any interesting experience there is to be had. He travelled to London to offer support to the Zep Boys and he is off to McCartney in Melbourne with tickets ridiculously close to the stage. His home is like a show biz museum. He is also my mate. ← Bogart’s Marlowe wasn’t as genuine as this one!